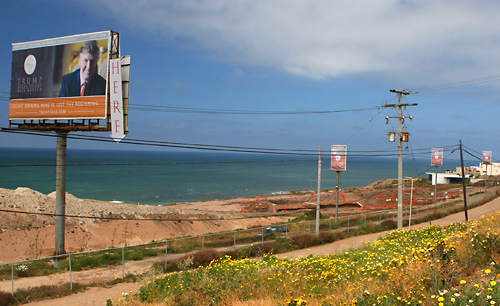 The only Mexican lawsuit I can find that Trump “won” was against his partners in the never completed Trump Ocean Resort Baja … a planned condominium development in Punta Bandara, Tijuana… in which (mostly US) investors claimed they lost 32 million dollars and Trump (who further claimed he was only a “spokesman” for the development… even though he and his daughter both made public claims that they were the developers), claiming he lost 40 million dollars, also sued the developer. The developer, for their part, went into bankruptcy. Mexican and California courts both heard suits, the Mexican settlement favoring small investors, as did the U.S. settlement. In the U.S., the developer came up with 7.25 million dollars — not nearly enough to cover the losses to small investors, let alone Trump. If he can’t collect, it has nothing to do with Mexican “corruption”, unless he means whoever signed off on this project in the first place. As it is, Trump should be liable for the environmental cleanup and restoration of the land … and removal of that ugly sign that still disgraces the landscape. 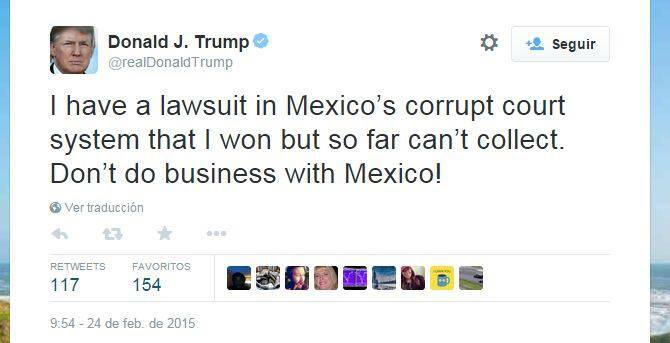 El Candigato Morris (Facebook), Donald Trump (twitter). If he got bilked I would definitely call that Karma at work !!! Ha Ha Ha!! The Poor 1%, excuse me as I cry in my beer for them. Lawrence O’Donnell occasionally goes after Trump on MSNBC, pointing out that his claims of wealth are greatly exaggerated, because just about everything he “owns” is heavily leveraged. I say that it takes a great deal of talent to lose money on a gambling casino, and yet, Trump’s casinos lose money.